In Part 1 of The Real Housewives of New Jersey Season 8 reunion, the two-part reunion begins with Teresa Giudice’s brutal honesty about where her marriage stands today. 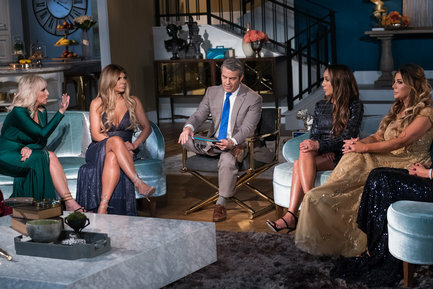 Next, tensions resurface as Margaret Josephs and Siggy Flicker look back on their rocky relationship, and for the first time since season two, Danielle Staub returns for the reunion and gets candid with Teresa. Afterwards, the ladies go head to head over “Cakegate,” and Melissa Gorga demands an apology from Siggy. But the biggest shock comes when Kim D arrives on set, pushing Teresa to her limit. Watch a sneak peek preview below! In this clip, Margaret and Siggy's feud reaches a new level as the two argue over eachother's foyer and Margaret reveals that Siggy reported her to PETA. In this other clip, Teresa addresses the possibility of her husband Joe Giudice being deported and admits that she wouldn't mind living in Italy. In this last clip, Kim D shows up at the reunion and Teresa and her get into a screaming match!